Dec. 5 at the Oxford. 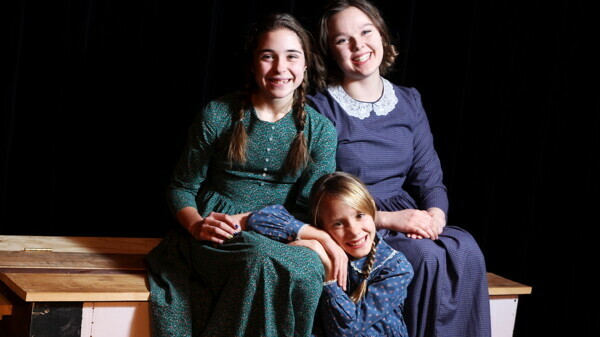 A play that demonstrates how the bonds of family can overcome hardship, the Eau Claire Children’s Theatre’s production of A Laura Ingalls Wilder Christmas will be the perfect show to attend if you’re looking from some quality time with the family this holiday season. Wayne Marek, the director, describes it as a period play. It isn’t terribly serious since there is humor, but it isn’t considered a comedy. The play begins with the Ingalls family – who you’ll remember from The Little House on the Prairie TV series and books – suffering through a series of tragic events and being forced to move west. They end up in Burr Oak, Iowa, running a hotel and living together in a single room. As solemn as the beginning may be, Marek explained that the play establishes the strength of family bonds since the Ingalls family works through this tough period by sticking together. Since it’s a Christmas play, the festive setting naturally brings the play’s message together. The play is short, around an hour long, so this is a great chance to escape the hustle and bustle of the holiday season and enjoy some time with your family. The play has a very small cast, only six people, and as a result, it depends very heavily on the players and less on props. Marek said the show will involve a lot of pantomime and suggested action. With six people, a scene in which their hotel is busy won’t have 10 extras moving about and interacting with those on stage. Instead, they will create a busy atmosphere through suggested actions and the use of sound effects. For many audience members, this will give them a unique theatrical experience that will no doubt make the play much more interesting. The play takes place during the two years Laura Ingalls chose not to write about, so whether you are a fan of the Little House books or simply want to watch a wonderful play with the family, you will enjoy A Laura Ingalls Wilder Christmas.